Special pack of Acuvue Oasys lenses designed for the most demanding conditions – ideal for anyone with sensitive. Sold in value pack with high-quality Gelone solution and contact lens case. Acuvue Oasys were created to ensure comfort and clarity in the most demanding conditions. Thanks to their silicone-hydrogel material, Sanofilcon A, the lenses offer an exceptionally high level of oxygen permeability. The patented Hydraclear wetting agent keeps the contact lenses moisturised throughout the wearing period and helps resist the formation of deposits. 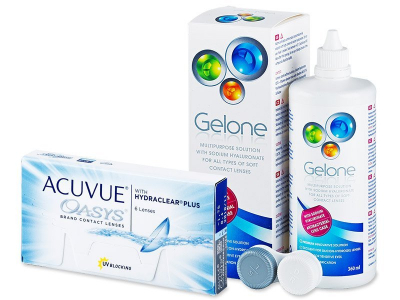 Gelone is a special, multipurpose solution for storing and cleaning all types of soft contact lenses. 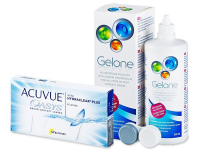 Thanks to its unique composition, which was created with a combination of disinfecting ingredients and sodium hyaluronate, Gelone solution is an excellent choice for even the most sensitive eyes. The cleaning components that are included in the solution, along with the antibacterial case with ionisation finish, create a perfect environment for disinfection. Hyaluronic acid provides flexibility, softness, and moisture for contact lenses and wearers. Great combination and value. I love this solution.